After studying architecture in college, Kai followed his interests in woodworking and wild spaces around the country: building boats in Maine, timber frames in North Carolina, and treehouses in Seattle. Kai returned to his roots in the lower Hudson Valley in 2006 to settle and start a family. 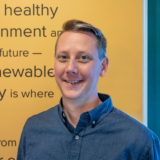 Shortly thereafter, he combined his construction experience with his interest in environmental issues and ended up in the solar industry in 2008. After ten years, the urgency to implement responsible solutions to climate change has sustained his dedication to solar. If he can find any time between work and family time with his wife and two kids, you might find him kayaking on the Hudson River or running trails in the Hudson Highlands.